In the 21st century Technology, telephone history has truly transformed into amazing possibilities with the emergence of Internet telephone service [VoIP] and it's related facilities that have helped to reduce or save money on daily phone calls made by respective users. phone or handset. It is a USB Internet based telecommunication device with a standard RJ 11 telephone port or jack, adaptable to any regular phone or handset for making free phone calls; local and international calling especially to almost any phone in US and Canada. How reliable and clear making cheap voip phone or free phone calls on voice over the Internet protocol(VoIP)? Any Internet connection with a minimum data transfer rate of 128kb/s can carry most Internet voip services or Magic Jack service facility. First year calls are free when acquired and users are able to choose their respective personal or business phone numbers from any state of choice in the US. It's quite simple to setup. This telephone service on Internet connection protocol required for this device goes on a basic data transfer rate of 128kb/s for most "VoIP" telephony or Magic Jack service. Plug any phone into the Rj11 Jack. 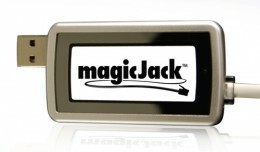 Plug Magic Jack into a USB port. Pick up your phone and talk for free. The voip services of MagicJack device work in any country in the world as it is solely dependent on Internet access for International calling, though better enjoyed by users living in the US and Canada on free calls. Making local and International calls under the platform of VoiP services which have helped many users to reduce cost and save money on calls made. The good thing about this USB device is that it is absolutely 100% plug and play device with it's embedded installation software to get it properly installed connected for usage. It can be connected a phone set extension like the photo beside. It gives access to users to choose only one special land line number from any the states, cities of your choice in the US. It works in anywhere in the world where there's an Internet access. The clarity of voice calls made via a magic jack telephone device is quite unbeatable. I had to put up this review on this 21st Century device that has impressed me so much as a user on it's exciting innovations and freedom. Wouldn't you mind sharing with us your testimony about MagicJack. I've read so much about this, I'll might give it a look. Thanks.